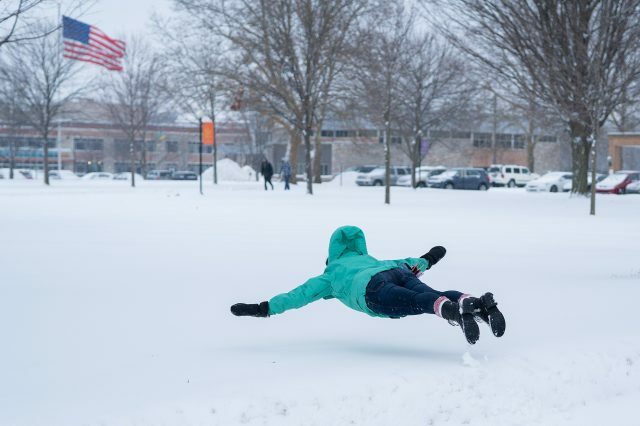 In the midst of an arctic blast leading to nearly three days of sub-zero temperatures, Goshen College decided to close campus beginning Tuesday at 4 p.m. and lasting through Thursday at 4 p.m.. This is only the fourth time in school history the campus has closed due to extreme winter weather. All classes and extracurriculars are cancelled until the campus reopens. The dining hall is operating under special hours, 10 a.m. thru 6 p.m.. Following a warmer-weathered storm that dropped several inches of snow on Monday, frigid temperatures swept in during the day on Tuesday. The college announced the campus closure Tuesday morning. Windchill temperatures are expect to dip down to nearly -50 degrees Fahrenheit, and actual temperatures will hover near -14 degrees Wednesday. On Thursday, highs remain in the negatives, with double digit negative windchill temperatures. These are some of the coldest temperatures on record for this region. The first time Goshen College closed campus due to weather was during the blizzard of 1978, when Goshen saw nearly 36 inches of snow from Jan. 25-29. Several current faculty were students during that first closure, including Duane Stoltzfus, professor of communications. “All of us who were students during the Blizzard of ’78 felt like members of an exclusive club: we could say — and we often did — that ‘we were there’ during the only time in the college’s history when it closed down because of snow,” said Stoltzfus in a Record article published in 2011, the second time Goshen College closed, also due to blizzard conditions. The third closure came in 2014 in response to extreme cold. An increase in commuter students in recent years also plays into the decision to close campus. Despite cancelled classes, “learning will continue,” Newbold said. “We have a lot of opportunities to continue our learning environment.” Newbold cited resources such as online assignments and Zoom meetings as ways that allow for flexibility in how faculty engage with students. In cold this severe, it is advised to remain indoors as much as possible, as frostbite can occur in as little as 10 minutes. If it is necessary to venture outside, be prepared. Wear layers and limit skin exposure as much as possible. Wear warm, waterproof footwear, remember hats and mittens and be on the lookout for signs of frostbite, which include waxy skin and numbness. If required to drive, make sure the gas tank is full and there are emergency blankets in the vehicle. Be sure to keep a fully charged phone on hand. Relief will come with the weekend alongside rain, with temperatures rising more than 60 degrees to the mid-40s on Sunday and Monday.